Improve on the why: make it more clear that Plan S is part of a broader transition towards open science and not only to make papers available and OA cheaper. It is part of changes to make science more efficient, reliable and reusable. Plan S brings great potential, and with that also comes great responsibility for cOAlition S funders. From the start, plan S has been criticized for its perceived focus (in intent and/or expected effects) on APC-based OA publishing. In our reading, both the principles and the implementation guidance recognize for all forms of full OA publishing, including diamond OA and new forms of publishing like overlay journals. However, it will depend to no small extent on the actual recognition and support of non-APC based gold OA models by cOAlitionS funders whether plan S will indeed encourage such bibliodiversity and accompanying equity in publishing opportunities. Examples of initiatives to consider in this regard are OJS journal systems by PKP, Coko open source technology based initiatives, Open Library of Humanities, Scoap3, Free Journal Network, and also Scielo and Redalyc in Latin America. The issue of evaluation and assessment is tied closely to the effects Plan S can or will have. It is up to cOAlitionS funders to take actionable steps to turn their commitment to fundamentally revise the incentive and reward system of science in line with DORA into practice, at the same time they are putting the Plan S principles into practice. The two can mutually support each other, as open access journals that also implement other open science criteria such as pre-registration, requirements for FAIR data and selection based on rigorous methodological criteria will facilitate evaluation based on research quality. Make sure to (also) provide Plan S in the form of one integrated document containing the why, the what and the how on one document. Currently it is too easy to overlook the why. That document should be openly licensed and shared in a reliable archive. In the implementation document include a (graphical) timeline of changes and deadlines. Looking at your first question for feedback (Is there anything unclear or are there any issues that have not been addressed by the guidance document?) we would like to bring a number of issues to your attention. Acknowledging the resulting limits on potential (re)use, consider including an opt-out of the license requirements by accepting CC-BY-ND when requested, in order to increase support of humanities. Acceptance of separation of publishing and peer review in 2 locations/systems. The implementation guidance text potentially casts some doubts about the eligibility of overlay journals when the publication (including any revisions following peer review) resides on e.g. a preprint server or repository, rather than being published on the overlay journal platform. In these cases, only the peer review is taken on by the overlay journal, and the article would of course be listed as being included in the overlay journal. In terms of the four traditional functions of publishing, the overlay journal would serve the functions of certification and dissemination, but not those of registration and archiving. Open Access platforms referred to in this section are publishing platforms for the original publication of research output (for example scholarly articles and conference proceedings). Platforms that merely serve to aggregate or re-publish content that has already been published elsewhere are not included. In this regard, it is also interesting to note that Jean-Sebastian Caux commented on our earlier version of the then-eight routes that he does not consider SciPost an overlay journal in that sense of the word, because SciPost does publish articles on its own platform (https://101innovations.wordpress.com/2018/10/22/eight-routes-towards-plan-s-compliance/#comment-203). A possible way to elucidate the intent of cOAlition S in this regard might be to explicitly mention (perhaps added to the paragraph quoted above) that overlay journals taking on peer review and publishing the resulting articles are compliant, even when the articles themselves do not reside on the platform of the overlay journal. But this is indeed relatively uncharted territory. The are quite some (technical) requirements for journals and repositories. We would like to see cOAlition S to commit to support the implementation of those requirements by smaller (esp. non-APC-based) journals and repositories. This can be done by (financially) supporting technical solutions and co-organize training, materials (e.g. video) and meetings to help implementation. The requirements for journals do not seem to apply to hybrid journals in transformative agreements. This creates the strange situation that a lot of hybrid journals will be held to much lower standards than full OA journals, platforms and repositories and do not have to invest until (in some cases, depending on agreement timing) 2025. To redress this to some extent, we would like to advise relaxation of the technical and other requirements mentioned in article 9.2 and 10.2 (XML, JATS (or equivalent), API, CC0 metadata incl. references, and transparent cost/prices) for instance until 2021 (instead of 2020). It says now “COAlition S acknowledges existing transformative agreements. However, from 2020 onward, new agreements need to fulfil the following conditions to achieve compliance with Plan S”. There is a chance that by pre-2020 signing of long term contracts hybrid could remain compliant even after 2024. To avoid that we would change the wording to include a maximum running period length for existing (pre-2020) contracts to be acknowledged. E.g. change this into “COAlition S acknowledges existing transformative agreements with contract periods that do not go beyond 2022”. We also recommend replacing ‘existing transformative agreements’ with ‘existing off-setting, read-and-publish and publish-and-read agreements’ to prevent confusion as to what is meant by ‘transformative agreements’. To further explore this bias, and give context to the interpretation of results derived from looking at full gold OA journals in Web of Science only, we analyzed the inclusion of DOAJ journals in WoS per major discipline. We also looked at the proportion of DOAJ journals (and articles/reviews therein) in different parts of the Web of Science Core Collection that we used: either in the Science Citation Index Expanded (SCIE) / Social Sciences Citation Index (SSCI) /Arts & Humanities Citation Index (AHCI), or in the Emerging Sources Citation Index (ESCI). The Emerging Sources Citation Index contains a range of journals not (yet) indexed in the other citation indexes, including journals in emerging scientific fields and regional journals. It uses the same quality criteria for inclusion as the other citation indexes, notably: journals should be peer reviewed, follow ethical publishing practices, meet Web of Science’s technical requirements, and have English language bibliographic information. Journals also have to publish actively with current issues and articles posted regularly. Citation impact and a strict publication schedule is not a criterion for inclusion of journals in ESCI, which means that also newer journals can be part of ESCI. Journals in ESCI and the AHCI do not have a Clarivate impact factor. We compared the number of DOAJ journals in Web of Science to the total number of journals in DOAJ per discipline. For this, we made a mapping of the LCC-classification used in DOAJ to the major disciplines used in Web of Science, combining Physical Sciences and Technology into one to get four major disciplines. For a number of (sub)disciplines, we identified the number of full gold journals in Web of Science Core Collection, as well as the number of publications from 2017 (articles & reviews) in those journals. We also looked what proportion of these journals (and the publications therein) are listed in ESCI as opposed to SCIE/SSCI/AHCI. For subdisciplines in Web of Science, we identified 10 research areas in each major discipline with the highest number of articles & reviews in 2017. Web of Science makes use of data from Unpaywall for OA classification at article-level. Looking at the total number of journals in DOAJ and the proportion thereof included in Web of Science (Fig 1, Table 1) shows that Web of Science covers only 32% of journals in DOAJ, and 66% of those are covered in ESCI. For Social Sciences and Humanities, the proportion of DOAJ journals included in WoS is only 20%, and >80% of these journals are covered in ESCI, not SSCI/AHCI. This means that only looking at WoS leaves out 60-80% of DOAJ journals (depending on discipline), and only looking at the ‘traditional’ citation indexes SCIE/SSCI/AHCI restricts this even further. We then compared the the proportion of DOAJ journals covered in SCIE/SSCI/AHCI versus ESCI, to the proportion of publications in those journals in the two sets of citation indexes (Fig 3). This reveals that for Physical Sciences & Technology and for Life Sciences & Medicine, the majority of full gold OA articles in WoS is published in journals included in SCIE, indicating that journals in ESCI might predominantly be smaller, lower volume journals. For Social Sciences and for Humanities, however, journals in ESCI account for the majority of gold OA articles in WoS. This means that due to WoS indexing practices, a large proportion of gold OA articles in these disciplines is excluded when considering only what’s covered in SSCI and AHCI. The overall patterns observed for the major disciplines can be explored more in detail when looking at subdisciplines (Fig 3). Here, some interesting differences between subdisciplines within a major discipline emerge. In Physical Sciences and Technology, three subdisciplines (Engineering, Mathematics and Computer Sciences) have a large proportion of full OA journals that is covered in ESCI rather than SCIE, and especially for Engineering, these account for a sizeable part of full gold OA articles in that subdiscipline. In Life Sciences and Biomedicine, General and Internal Medicine seems to be an exception with both the largest proportion of full OA journals in ESCI as well as the largest share of full gold OA publications coming from these journals. In contrast, in Cell Biology, virtually all full gold OA publications are from journals included in SCIE. In Social Sciences, only in Psychology a majority of full gold OA publications is in journals covered in SSCI, even though for this discipline, as for all other in Social Sciences, the large majority of full gold OA journals is part of ESCI, not SSCI. In Arts & Humanities the pattern seems to be consistent across subdisciplines, perhaps with the exception of Religion, which seems to have a relatively large proportion of articles in AHCI journals, and Architecture, where virtually all journals (and thus, publications) are in ESCI, not AHCI. Our results clearly show that in all disciplines, the traditional citation indexes in WoS (SCIE, SSCI and AHCI) cover only a minority of existing full gold OA journals. Looking at publication behaviour, journals included in ESCI account for a large number of gold OA publications in many (sub)disciplines, especially in Social Sciences and Humanities. Especially in terms of an analysis of availability of full OA publication venues in the context of Plan S, it will be interesting to look closer at titles included in both SCIE/SSCI/AHCI and ESCI per (sub)discipline and assess the relevance of these titles to different groups of researchers within that discipline (for instance by looking at publication volume, language, content from cOAlitions S or EU countries, readership/citations from cOAlition S or EU countries). Looking at publication venues beyond traditional citation indexes fits well with the ambition of Plan S funders to move away from evaluation based on journal prestige as measured by impact factors. It should also be kept in mind that ESCI marks but a small extension of coverage of full gold OA journals, compared to the large part of DOAJ journals that are not covered by WoS at all. So far, we have looked at coverage of all DOAJ journals, irrespective of whether they meet specific criteria of Plan S for publication in full OA journals and platforms, including copyright retention and CC-BY license*. Analyzing data available through DOAJ (supplemented with our mapping to WoS major disciplines) shows that currently, 28% of DOAJ journals complies with these two criteria (Fig 4). That proportion is somewhat higher for Physical Sciences & Technology and Life Sciences & Medicine, and lower for Social Sciences & Humanities. It should be noted that when a journal allows multiple licenses (e.g. CC-BY and CC-BY-NC-ND), DOAJ includes only the most strict license in its journal list download. Therefore, the percentages shown here for compliant licensing are likely an underestimation. Furthermore, we want to emphasize that this analysis reflects the current situation, and thereby could also be thought of as pointing towards the potential of available full OA venues if publishers adapt their policies on copyright retention and licensing to align with criteria set out in Plan S.
*The current implementation guidance also indicated that CC-BY-SA and CC0 would be acceptable. These have not been included in our analysis (yet). Additional requirements concern copyright (copyright retention by authors or institutions), licensing (CC-BY, CC-BY-SA or CC0), embargo periods (no embargo’s) and technical requirements for open access journals, platforms and repositories. In the discussion surrounding plan S, one of the issues that keeps coming back is how many publishing venues are currently compliant. Or, phrased differently, how many of their current publication venues researchers fear will no longer be available to them. However, the current state should be regarded as a starting point, not the end point. 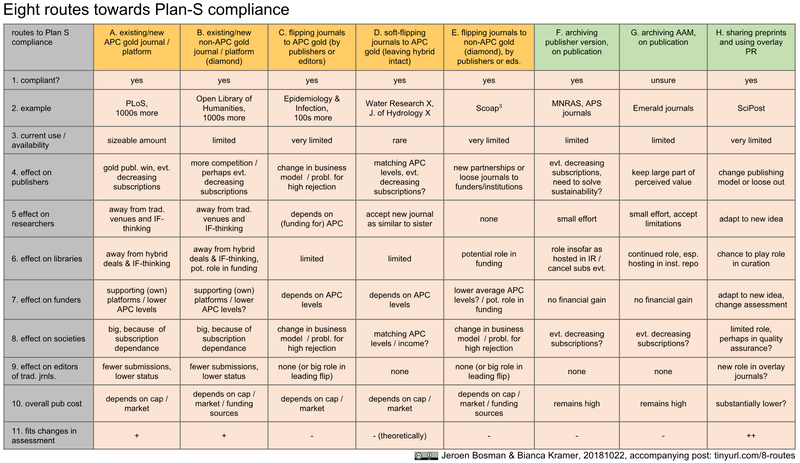 As Plan S is meant to effect changes in the system of scholarly publication, it is important to look at the potential for moving towards compliance, both on the side of publishers as well as on the side of authors. To get a first indication as to what that potential for open access is across different disciplines, we looked at a particular subset of journals, namely those in Web of Science. For this first approach we chose Web of Science because of its multidisciplinary nature, because it covers both open and closed journals, because it has open access detection and because it offers subject categories and finally, because of its functionality in generating and exporting frequency tables of journal titles. We fully recognize the inevitable bias related to using Web of Science as source, and address this further below and in an accompanying blogpost. For a number of (sub)disciplines, we identified the proportion of full gold, hybrid and closed journals in Web of Science, as well as the proportion of hybrid and closed journals that allows green open access by archiving AAM/VOR in repositories. We also looked at the number of publications from 2017 (articles & reviews) that were actually made open access (or not) under each of these models. We only looked at green OA for closed articles, i.e. when articles were not also published OA in a gold or hybrid journal. We used the full WoS Core collection available through our institution’s license, which includes the Science Citation Index Expanded (SCIE), the Social Sciences Citation Index (SSCI), the Arts & Humanities Citation Index (AHCI) and the Emerging Sources Citation Index (ESCI). 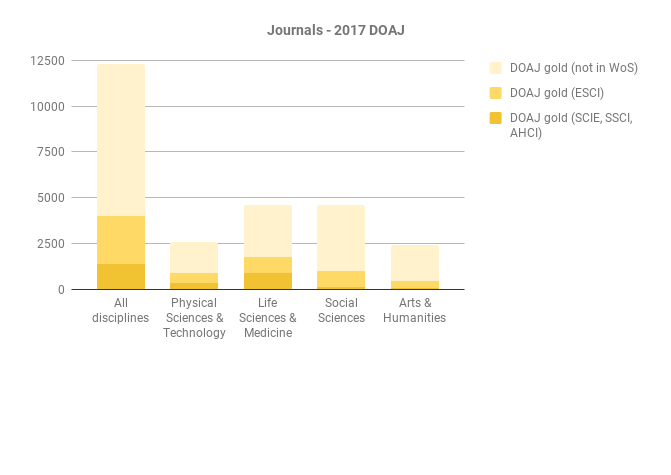 As seen in Figure 1A-B, the proportion of full gold OA journals is relatively consistent across major disciplines, as is the proportion of articles published in these journals. Both are between 15-20%. Despite a large proportion of hybrid journals in Physical Sciences & Technology and Life Sciences & Medicine, the actual proportion of articles published OA in hybrid journals is quite low in all disciplines. The majority of hybrid journals (except in Arts & Humanities) allow green OA, as do between 30-45% of closed journals (again except in Arts&Humanities). However, the actual proportion of green OA at the article level is much lower. As said, embargo periods (esp. those exceeding 12 months) might have an overall effect here, but the difference between potential and uptake remains striking. Looking at subdisciplines reveals interesting differences both in the availability of open access options and the proportion of articles & reviews using these options (Fig 2). In Physical Sciences and Technology, the percentage of journals that is fully gold OA is quite low in most fields, with slightly higher levels in energy fuels, geology, optics and astronomy. Uptake of these journals is lower still, with only the optics and geology fields slightly higher. Hybrid journals are numerous in this discipline but see their gold and green open access options used quite infrequently. The use of green OA for closed journals, where allowed, is also limited, with the exception of astronomy. (but note that green sharing of preprints is not included in this analysis). In all fields in this discipline over 25% of WoS indexed journals seem to have no open options at all. Of all subdisciplines in our analysis, those in the physical sciences fields display the starkest contrast between the ample OA options and their limited usage. In Life Sciences & Biomedicine, penetration of full gold OA journals is higher than in Physical sciences, but with starker differences, ranging from very low levels in environmental science and molecular biochemistry to much higher levels for general internal medicine and agriculture. In the Life sciences and Biomedicine discipline, uptake of gold OA journals is quite good, again especially in general internal medicine. Availability of hybrid journals is quite high but their use is limited; exceptions are cell biology and cancer studies that do show high levels of open papers in hybrid journals. Green sharing is a clearly better than in Physical sciences, especially in fields like neurosciences, oncology and cell biology (likely also due to PMC / EuropePMC) but still quite low given the amount of journals allowing it. In Social Sciences there is a large percentage of closed non-hybrid subscription journals, but many allow green OA sharing. Alas the uptake of that is limited, as far as detected using Unpaywall data. In this regard the one exception is psychology, with a somewhat higher level of green sharing. Hybrid OA publishing is available less often than in Physical Sciences or Life Sciences, but with relatively high shares in psychology, sociology, geography and public administration. The fields with the highest shares of full gold OA journals are education, linguistics, geography and communication, with usage of gold in Social Sciences more or less corresponding with full gold journal availability. In Arts & Humanities, the most striking fact is the very large share of journals offering no open option at all. Like in Social Sciences, usage of gold across Humanities fields more or less corresponds with full gold journal availability. Hybrid options are limited and even more rarely used, except in philosophy fields. Green sharing options are already limited, but their use is even lower. 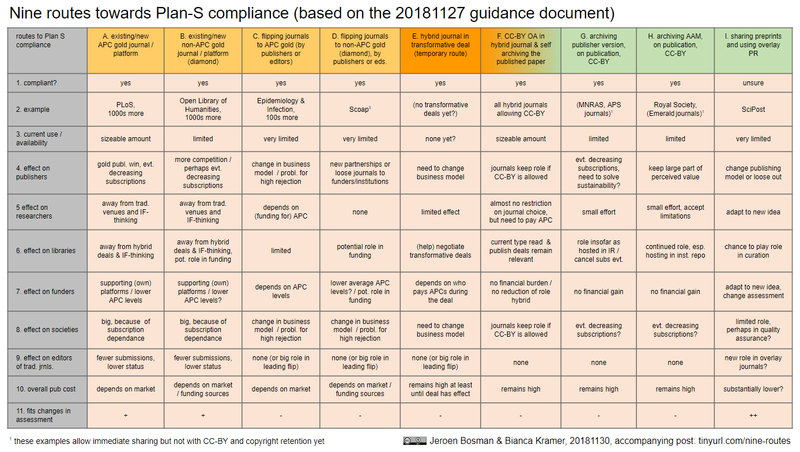 We also made a more detailed analysis of nine possible routes towards plan S-compliance (including potential effects on various stakeholders) that might be of interest here. In their implementation guidance, cOAlition S states it will commission a gap analysis of Open Access journals/platforms to identify fields and disciplines where there is a need to increase their share. In doing so, we suggest it would be good to not only look at the share of currently existing gold OA journals/platforms, but view this in context of the potential to move towards plan S compliance, both on the side of publishers and authors. Filling any gaps could thus involve supporting new platforms, but also supporting flipping of hybrid/closed journals and supporting authors in making use of these options, or at least considering the effect of the latter two developments on the expected gap size(s). Language: English and/or at least one EU language accepted? Content from cOAlition S or EU countries? Readership/citations from cOAlition S or EU countries? Editorial board (partly) from cOAlition S or EU countries? Of course we ourselves already made a selection by using WoS, and we fully recognize this practical decision leads to limitation and bias in the results. For a further analysis of inclusion of DOAJ journals in WoS per discipline, as well as the proportion of DOAJ journals in ESCI vs SCIE/SSCI/AHCI, see the accompanying blogpost ‘Gold OA journals in WoS and DOAJ‘. To further explore bias in coverage, there are also other journal lists that might be worthwhile to compare (e.g. ROAD, EZB, JournalTOCs, Scopus sources list). Another interesting initiative in this regard is the ISSN-GOLD-OA 2.0 list that provides a matching list of ISSN for Gold Open Access (OA) journals from DOAJ, ROAD, PubMed Central and the Open APC initiative. It is especially important to ensure that existing (and future) publishing platforms, diamond OA journals and overlay journals will be included in any analysis of gold OA publishing venues. One initiative in this area is the crowdsourced inventarisation of (sub)areas within mathematics where there is the most need for Fair Open Access journals. Ultimately, this could result in an open database that would allow multiple views on the landscape of OA publication venues and the usage thereof, enabling policy makers, service providers (including publishers) and authors alike to make evidence-based decisions in OA publishing. We would welcome an open (funding) call from cOAlition S funders to get people together to think and work on this. On October 22 we posted Eight routes towards Plan S compliance. Meanwhile, cOAlition-S, the group of funders responsible for Plan S, has put out a guidance document detailing implementation of the plan. Based on those details we updated our scheme of routes to achieve compliance. compliance of hybrid journals if they are part of a transformative deal with maximum length of 3 years. These and some other, smaller changes effect the compliant routes available. We have hence adapted the scheme and the list of routes. For each of the routes the scheme shows examples (please treat them as such), assessments of effects on various stakeholders and on overall cost and also whether the route aligns with expected changes in the evaluation system. In our view it is useful to discern 4 potential gold routes, 1 (temporary) hybrid route, 1 hybrid/green route and 3 potential green routes. Flipping journals to non-APC-based gold (diamond), by publishers or editors taking the journal with them. Using a hybrid journal that is part of a transformative agreement with a funder or institution. This is a temporary option (until the end of 2024). Publishing your article open access and CC-BY in a non-compliant hybrid journal and self-archiving that article in a compliant repository. Plan S – response to alternatives proposed by Kamerlin et al. The recent substantial critique* by a group of mainly chemistry researchers to Plan S has garnered a lot of discussion on Twitter and in blogposts (e.g. Plan S, Antwort auf die Kritik), mostly around the risks the authors associate with the implementation of Plan S in its current form. The authors, in their well-thought-out piece, also include four solutions as alternatives to Plan S, and these have as yet, to our knowledge, not been given as much attention they deserve. To further the healthy debate around both Plan S and alternative (existing) options for open access, we hereby provide our point-by-point response to the four scenarios sketched by the authors (below in cursive) and how we feel they relate to the goals and methods as proposed in plan S.
1) by limiting immediate access to subscriptions, it would limit access to only those researchers (typically from richer institutions) that can afford those subscriptions, excluding researchers from other institutions, non-affiliated researchers, members of society, NGOs, small and medium (and large) companies, start-ups and non-profits, from immediate access to scientific and scholarly findings and the benefits flowing from that. Thus, this is arguably not an optimal solution for most stakeholders. 2) Currently, most delayed open access models do not include an open license for the publications involved, making this a read-only model rather than a true open access model that enables access as well as re-use. 3) Currently, as far as we know, publishers making journals available free to read after a number of months or years do not guarantee in any way that they will remain available. If the journal is sold to another publisher, volumes may become unavailable again. 4) This does not solve the problem currently unsustainable subscription prices, one of the very reasons of the push for OA. NB1 The law recently approved in Belgium deals with the authors’ right to archive and sharing the manuscript of a publication after 6-12 months embargo, e.g. in a repository, not with the publisher making closed publications open on the publisher platform. It therefore more closely relates to solution 2 proposed by the authors. (see below). NB2 It is unclear why the authors seem to argue that society journals should be exempted from this model (“it would then be possible to exclude any (non-society) journals that won’t accept this policy”). There seems to be a misunderstanding here around the difference between preprints and the deposition of published articles (either publisher version, or the author-version after acceptance by the publisher). The OA requirements of NIH and many other funders concern the latter (e.g. through deposition in PubMed Central). While this model has indeed resulted in a large proportion of publications from NIH (as well as, for instance, the Wellcome trust) to be OA, where an embargo is involved (such as with NIH) it has the same drawbacks regarding non-immediate access as discussed above for scenario 1. As with scenario 1, it also does not provide incentives for publishers to change their publication model nor for funders, institutions and researchers to change the reputation-driven publication system. NB The further benefits discussed in this scenario (early-stage dissemination, real-time feedback, circumventing long publication time scales) are benefits that are associated with preprints. Additional benefits of this model include a demonstrable trace of the scholarly record (e.g. being able to see changes made in an article as the result of peer review and community feedback). (3) We note here also that more and more reputable publishers are now adding high quality open access publications to their repertoire of journals. In particular, we encourage fully open access journals published by scientific societies. A brief (but by no means exclusive) list of examples of such journals include ACS Central Science , ACS Omega , Chemical Science , RSC Advances , the Royal Society journals Open Biology and Open Science , IUCrJ and eLife , among others. A move to a fully open access landscape is clearly going to become much easier when there are more journals that can guarantee the same level of quality control and sustainability as current reputable subscription journals, as venues to disseminate one’s work. It may be a slower transition, but making this transition in an ecosystem that supports it does not infringe on academic freedom as Plan S does. Clearly, the overall march towards Open Knowledge Practices seems inevitable, as well as desirable, as researcher consciousness about the means of research dissemination, the possibilities, and the important ethical issues surrounding closed science increases. We must be careful to encourage this march in a way that does not replace one problem with another. The increase in the number of good quality open access venues (both from commercial and non-profit publishers, as well as from scholarly societies) is fully in line with what Plan S aims to stimulate. While there are clearly different opinions on the ways in which this development is best stimulated, there appears to be no difference in opinion as to the benefit of having a wide array of qualitatively good full OA publication options. It is encouraging to see that the authors include in their examples journals for multiple disciplines that do not claim to be selective based on perceived impact, but judge research on the basis of soundness (like ACS Omega and Royal Society Open Science), indicating that they do not equate quality with selectivity per se. It should also be noted Plan S includes the commitment of funders to apply rigorous criteria as to the quality of full OA publication venues, although the exact nature of these criteria remain to be decided on. Plan S also wants to cap APCs. Though it is as yet unknown at what level, it probably will be at a level below the highest APCs currently asked for by full OA journals. It is interesting to see that the examples given have APCs ranging from 0 to 2500 USD. Finally, the debate about Open Access, and APC, ignores the Diamond (also known as Platinum) model of OA publication. Diamond publication is a fully sponsored mode of publication, in which neither author nor publisher pays, but rather, the journals are funded by a third party sponsor. An example of Diamond OA is provided by the Beilstein Journals, all publications for which are covered by the non-profit Beilstein Institute in Germany . Similarly, there is no fee for publication in ACS Central Science, and all publication costs are covered by the American Chemical Society . It is important to ensure the moral and ethical integrity of that sponsor. But, when performed in an ethically uncompromised framework, this would be an ideal model for publications by scientific societies, whose journals could then either be sponsored by funders and other donors. In such a framework, rather than simply transferring costs from readers to authors, while allowing questionable journals to flourish and exploit APC, quality control can be ensured by financially supporting high quality not-for-profit publications. Would this not be a much braver step for European and National funders to mandate, than a push for pure Gold OA? Plan S explicitly does not state a preference for an author-paid APC model. Other forms of pure gold OA, like indeed diamond and platinum OA, are fully in line with plan S. Diamond not being compliant is thus a misunderstanding. Depending on the implementation, the stated intent of funders to “provide incentives to establish and support full gold OA versions where appropriate” might also take the shape of enabling diamond/platinum models. One possible model for this would be the announced plans for a publication platform financed by the EC that will require no APCs from authors or institutions. Overall, the four solutions proposed by the authors all represent tried-and-tested solutions that are practiced in various settings, and all are providing valuable contributions to progress in open access (or in some cases, free-to-read access) of research articles. Two of them (3 and 4) are, as models, fully in line with plan S. The other two (1 and 2) facilitate access but fall short of the ambitions of plan S to not only provide immediate open access to research articles, but also to stimulate a shift in publishing away from a subscription-based journal system. Whether those ambitions and their proposed implementation are deemed to risky, too forceful and/or too limited in geographical scope to be beneficial to research and researchers remains a topic of debate even (or perhaps especially) among proponents of open research practices, which include both the original authors and ourselves. The prospectus SpringerNature released on April 25* in preparation of its intended stock market listing provides a unique view into what the publisher thinks are the strengths of its business model and where it sees opportunities to exploit them, including its strategy on open access publishing. Whether the ultimate withdrawal of the IPO reflected investors’ doubt about the presented business strategies, or whether SpringerNature’s existing debts were deemed to be too great a risk, the prospectus has nonetheless given the scholarly community an insight into the publisher’s motivations in supporting and facilitating open access. In the document, aimed at potential shareholders, the company outlines how it stands to profit from APC (article processing charge)-based gold open access in an otherwise traditional publishing system that remains focused on high-impact factor journals. From this perspective, a market with high barriers to entry for new players is a desirable situation. Any calls for transparency of contracts, legislation against exclusive ownership of content by publishers, public discussion on pricing models and a move towards broader assessment criteria – beyond impact factors – are all seen as a threat to the company’s profits. Whether this position also benefits the global research community is a question worth asking. First, this goes to show that APCs are paid not just to cover processing costs but to buy standing for a researcher’s article (if accepted). This is not new: other traditional publishers such as Elsevier, but even pure open access publishers such as PLoS and Frontiers, tier their market and ask higher APCs for their more selective journals. Second, this prospectus section shows SpringerNature interprets impact factors and journal brands as what makes a journal valuable to authors and justifies high APCs – and not aspects such as quality and speed of peer review, manuscript formatting, or functionality and performance of the publishing platform. Third, and most striking, is the deliberate strategy to raise APCs by securing and increasing impact factors of journals. SpringerNature admits it depends on impact factor thinking among researchers and seeks to exploit it. The explicit aim to exploit impact factors and the presumed dependence of researchers on journal reputation is in sharp contrast with SpringerNature (to be precise BioMedCentral, SpringerOpen and Nature Research) having signed the San Francisco Declaration on Research Assessment (DORA). By signing, these SpringerNature organisations agree with the need to “greatly reduce emphasis on the journal impact factor as a promotional tool” as the declaration states. The information revealed through the prospectus now raises the question whether signing DORA and the Nature editorial statements were in effect merely paying lip service to appease those worried by toxic effects of impact factor thinking, or whether they have real value and drive policy decisions by journal and publisher leadership. It could be argued that commercial publishers are foremost responsible for their financial bottom line, and that if enough researchers (or their institutions or funders) are willing and able to pay higher APCs for high impact factor journals, then that is a valid business model. However, scientific publishers do not simply “follow the market”. For better or for worse, their business models influence the way academic research is prioritised, disseminated and evaluated. High APCs make it harder for researchers without substantial funds (eg, researchers from middle- and low-income countries, unaffiliated researchers and citizen scientists) to publish their research (or require a dependency on waivers), and a continued push for publishing in high impact factor journals by publishers, researchers and funders/institutions alike hampers developments towards more rigorous, relevant and equitable research communication. How do we break out of this? It is promising to see initiatives from publishers and funders/institutions such as registered reports (where a decision to publish is made on the basis of the research proposal and methodology, independent of the results), the TOP guidelines that promote transparency and openness in published research, and moves towards more comprehensive assessment of quality of research by institutions and funders, as highlighted on the DORA website. This will all help researchers do better research that is accessible and useful to as many people as possible, as might alternative publishing options coming from researchers, funders and institutions. Simply adding an “open access” option to the existing prestige-based journal system at ever increasing costs, however, will only serve to increase the profit margin of traditional publishers without contributing to more fundamental change in the way research is done and evaluated. * The prospectus has since been taken offline. We secured an offline copy for verification purposes, but unfortunately cannot share this copy publicly.